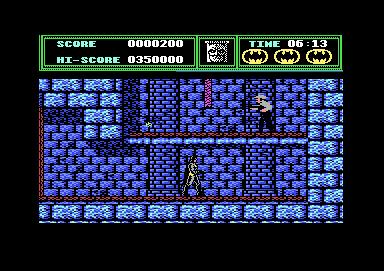 Ocean released two versions of BATMAN for the Commodore 64, SPECIAL FX created one and the other one (that I'm reviewing here) was created by Ocean's own coding team. The game is a multi-stage affair incorporating different styles of gameplay. Level One - THE AXIS CHEMICAL FACTORY - has you taking control of BATMAN, the idea being to make your way round the level dodging or shooting the enemies before getting to shoot at the bad guy Jack Napier and defeat him, or so you think... This level is displayed as a two dimensional platform game. As well as being able to shoot at the bad guys you also have a Bat Rope, this can help propel you to higher platforms or cross seemingly impossible gaps. 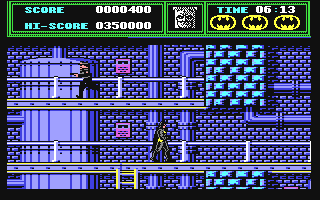 You have a time limit to complete the level, you are given three lives, each one is represented by a set amount of energy depicted by a nicely drawn energy bar, it starts off as Batman, but any time hazards like acid rain touch you, or villains hit you, it gradually turns into the Joker - clever stuff! There's a short end sequence when you complete this level too! Special mention must go to the Bat Rope, when you use it you really do get a sense of being Batman, while it does take some initial getting used to, perseverance does reap rewards. 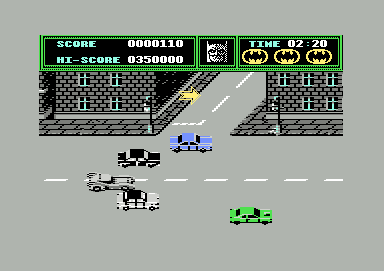 Level Two - BATMOBILE CHASE - has you taking control of the BAT-MOBILE, Its a horizontally scrolling level, you have to avoid the traffic, touching cars results in energy drain again. The viewpoint this time is sideways on, control is standard left, right etc, and you can also speed up or slow down the Bat-Mobile, which is useful for dodging traffic. The graphics are well drawn and smoothly moving with you driving through the streets of Gotham, taking Vicki Vale back to the Bat Cave to safety. It turns out you turned Jack Napier into the Joker when he dropped in the Vat and he's after the pair of you! An on-screen arrow points in the direction you need to go, usually it points right, but every so often it points up at a junction. When this happens you need to slow down and press fire and push up, this activates the Bat Rope, which latches onto the nearest lamppost and swings you into the junction. You get to see a short piece of animation depicting this, which looks really smart! This is a tough level, with a rousing piece of music to set the mood, and you literally have seconds to spare when you reach the end of level! When Reviewing this game Nobody seems to have noticed that the colours on the Bat-Mobile are wrong, hopefully REMEMBER or some other group will hack this level and release it with the correct colour scheme! Level Three - CHEMICAL ANALYSIS IN THE BATCAVE – and the action takes place on a single screen, the items the Joker has contaminated with chemicals plus some red herrings are all here. The idea is you move the cursor at the bottom of the screen and select the correct three of all the possible items to try and get a match. If you succeed you are congratulated and move on to the next level, otherwise you get another go, you get several chances at guessing the correct items, failure brings loss of life. Just to make things even more difficult you are also under a time limit, if this runs out you also die - Harsh! Level Four - THE CARNIVAL - uses similar graphics to Level Two however this time you are flying the BAT-WING. Graphics here are nicely drawn in fact this is another well put together level. During the Gotham Carnival, the Joker has filled all the Balloons with toxic gas to kill all the Gotham citizens. BATMAN must fly through the Carnival and cut the ropes connecting the Balloons to the floats by touching the bottom of the ropes. The Balloons fly harmlessly into the air (in the movie Batman collected them all, then took them out of the way). The features on this level that caught my eye where the Balloons, they are very similar in appearance to the ones in the film. Also look out for the shadow on the BAT-WING and the graphics for the BAT-WING itself, very nice animation! It would have been nice to have more lives or a continue from the last level option, also there seems to be a lack of extra lives to be gained! I would like to mention the music before I go any further. Matthew Cannon has worked really hard, doing a brilliant job of supplying the track for the Title Screen AND a different piece of music for each level (or you can play with just sound effects if you desire!) - very enjoyable! Overall opinion: A polished game that follows the plot of the film closely and will challenge the player for many hours. The game was released on Tape (pity the poor souls who bought that, the tape loading must have been a killer! ), Disk (which I own too!) and finally the Cartridge version which I've reviewed! I have to say this was one of my hardest games to acquire, it took me 4 goes on eBay to get this, and I finally won it in a bundle of 4 Cartridges. Also included was ROBOCOP 2, S.C.I. 2 and NAVY SEALS all of which I owned already apart from SCI 2 which I'd completed and gave away but I was THAT desperate I decided to bid for the bundle!